This post was originally published as part of the Thucydides Roundtable project over at Zenpundit. I encourage you to read all of the posts in the roundtable. All the world trembles at the dreaded "Thucydides trap." It is not clear to me that Thucydides intended this theory to be a general theory of why all great powers go to war, though many take it this way. The other famous phrase from this book—the Athenian declaration that they were motivated to build their empire by “fear, honor, and interest” (1.76)—has a far better claim to this title, followed as it is by the note, “it has always been the law the weaker should be subject to the stronger.” Thucydides invokes no laws in his famous one liner on the “real cause” of the war. Notice too that only one leg of his trinity is invoked to explain the Spartan decision for war. Were Thucydides serious about conflating the cause of this war with the cause of all wars, it would make sense to include the other two legs in his explanation. This roundtable's journey through Thucydides’ History gives us the chance to assess whether the "Thucydides trap" metaphor helpfully explains the historical events it is drawn from. To approach this question is to first ask another: can we untangle the events of the war itself from the narrative of the man who chronicled it? This is the issue at the center at this post; no one can appraise the work and words of Thucydides without carefully working through it. Thucydides is celebrated today as a man who articulated and developed grand principles of politics and conflict. However, Thucydides was not an explicit theorist of war. His book has themes, not theses. He does not prove, but impresses. These impressions are made through narrative art. The order in which Thucydides introduces ideas and events has great meaning; the amount of space he devotes to some events (but not to others) changes how readers perceive them. These subtle decisions of placement and length develop Thucydides’ main themes far more powerfully than his occasional editorial comments. Perceptive readers of Thucydides time, aware of the narratives Thucydides hoped his work would displace and familiar with the events he passes over, would understand exactly what Thucydides was doing. With us the challenge is harder. We don’t come to Thucydides’ History with preexisting knowledge of the war. Our only guide to Thucydides is Thucydides himself. We thus must read with utmost care. If we do not, we risk mistaking Thucydides' judgments about the war for the events of the war itself. The argument that Thucydides puts into Pericles’ mouth is simple: the coming war is not really about the decree at all, but more fundamental questions of power and rank. Is Athens subordinate to Sparta? Or are the two polis equal in rank? That was the real question being decided by this war. Any “ostensible cause” to get things rolling would do—in this case that ostensible cause just happened to be the embargo of Megara. But how did the Athenians get into this position, handing the Spartans such an easy cause to justify their war with? We do not know. Thucydides’ editorial decisions have made the Megarian decree something of a mystery. The Megarians and the Spartans maintained that the decree was a violation of the treaty of peace, though just how it was a breach in the treaty we are not sure. The Megarians formally listed their reasoning during the 431 conference of the Peloponnesian allies (1.67.4), but Thucydides does not relate the speech, nor tell us anything about it except that it was given. Of the debates that led the Athenians to enact the degree even less is written. We do not, in fact, even know what year the decree was enacted, or whether it came before or after the disputes with Corinth. Though we are told some Athenians argued for its repeal in the face of Spartan demands, their arguments, like that of the Megarians, are only mentioned in a sentence or two of narrative, as mere context for the speech given by Pericles that I have quoted above. See this for what it is: Thucydides has omitted from his history a central cause of the war! This was not an oversight. It may have been the entire point of Book I. In Thucydidean terms, the Megarian decree was (as Thucydides has Pericles say) “a trifle.” It was an “ostensible cause” of the great war, but not its true one. A war of this magnitude could not be caused by trifles, and to drive home the point of just how trifling and irrelevant this causus belli was to the war’s actual conduct, Thucydides crafts a narrative of the war that does not include it at all. This is clever, and Thucydides' contemporaries, quite aware of the decree’s details, probably considered the omission quite artful. While we don’t know the details of the debates surrounding the decree, it is easy to see how reporting those debates in detail might have undermined Thucydides’ narrative. Did the Athenians enact the decree in ignorance of its long-term consequences—was it merely an angry and reflexive response to a localized spat with the Megarians? If that was the case, then many would say that the Athenians stumbled into the war blindly, unaware of the import their actions would have on broader Hellas. What better caricature of bumbling democracy could there be? This image of Athens would serve Thucydides well later in his narrative, but it is at odds with his idealized portrait of Athens under Pericles, a time when "what was nominally a democracy became in his hands government by the first citizen” (2.65). This was the clear-sighted visionary whose guiding hand might have led Athens to victory! Bumbling into a great war does not match the narrative. On the other hand, if the Athenians knew exactly what they were doing in enacting the decree, then the decree was a challenge—a deliberate attempt to humiliate the Spartans, weaken their alliance, and goad them into war. If this is true then Thucydides’ grand narrative is weakened even more than if the Megarian degree was a simple, bumbling mistake. Sparta’s decision for war would then be less a fearful reaction to forty years of growing Athenian power than a measured response to a deliberate insult. Thanks to Thucydides, we do not know which of these is the true story. What we do know is that we do not have the true story. We cannot trust Thucydides to give us an honest picture of the past. The gaps in Thucydides’ account of the Megarian Decree are not unique. They appear again and again in the first book of the History, and creep even into the beginning sections of Book II. Many of these are moments Thucydides would have observed first hand. Thucydides reports that the Athenians debated the alliance with Corcyra twice before agreeing to dispatch two ships to the island’s defense. But his description is terse: “in the first assembly there was a manifest disposition to listen to the representatives of Corinth; in the second, public feeling had changed and an alliance with Corcyra was decided on.” (1.44.3). What the arguments of each side were, and why the public feeling changed so forcefully in favor of Corcyra (perhaps the influence of Pericles? ), is never revealed. The debates where the Athenians decided their demands on Potidaea are also ignored. And as mentioned earlier, the speeches against the general war, though noted, are not described in detail. Indeed, in all of Book I’s eighty pages, Thucydides includes only one speech from Athens’s internal debates, the speech in which Pericles declares that Sparta “always had designs against us” and that the time for Athens to go to war in defense of their rank had come, “without caring whether the ostensible cause [for war] be great or small” (1.141.4). Clever, is it not? Thucydides first book is a polemic. It is designed to prove that this was a war decades in the making, a product of Sparta’s growing fear over Athens growing power. For this scheme to work the growth of Athenian power must seem incessant and inevitable; it must be a trend beyond the control of individual men. But the actual course of events preceding the war suggests that this was hardly the case—before 433 BC, there was a rough balance of power between the two blocs. Athens was the master of the sea. Sparta was master of the land. With a few exceptions codified during the last peace, Athenian activities were restricted to Ionia and the Aegean. The Athenians had no interests in the Peloponnese, nor on the Adriatic coasts or in Sicily. In these regions their power was not growing. What threat the Athenians presented was to Spartan pride and self-esteem. The Athenians put all of Greece to shame with their massive temples and marble monuments. The Athenians built structures that surpassed Pan-Hellenic temples in Delphi; they hosted festivals no one in Greece could compete with. But until the affair in Corcyra, the Athenians showed no new geopolitical ambitions. The expedition to Corcyra almost did not happen. What if it hadn’t? It is a question worth asking. Opposition within Athens to the decisions of these years was constant, though it is difficult to know for what reasons this opposition arose. Perhaps it was because many in Athens earnestly did not wish a war with Sparta? If Thucydides’s glowing picture of Athen's first citizen is to be trusted, it is likely that events proceded as they did only because the leadership of famed Pericles. If Pericles had died years before, would there have been a war with Sparta? Had the opposition kept Athens out the Corcyran affair, would the Corinthians still have dragged the rest of the Peloponnesian League to war? Had the Athenians not directly challenged Sparta through the insult of the Megara decree, would the Spartans have been so eager to listen to the Corinthian call? We cannot know the answer to these questions. This is no accident: we cannot know the answer to these questions only because Thucydides does not want us to dwell on the answers to them. This suggests that the answers to these questions, if known and considered, would place a dent in his explanation for the war. Thucydides is not a historian to be trusted. Much more could be said on this theme. The Spartan decision for war seems no more inevitable than the Athenian one. It was Corinthian interests, not Spartan ones, at stake in Corcyra and Potidaea. Sparta could sacrifice these without the loss of anything but face. (Indeed, when the war began it was not clear to the Lacedaemonians that complete control of the littoral to their west and north would have damaged Sparta in any real way. Athens had complete control of the sea during the last war, after all, but she still lost it). The Corinthians had embarked upon a “private enterprise” (1.66) against the Athenians for the sake of “sectional interests” (1.82.6)—e.g., an enterprise whose profits would go to no one but themselves. The Spartans were clearly divided on the wisdom on helping them; it took substantial Corinthian lobbying of all the allies (1.119), direct insults to Sparta (1.68-1.71), two separate councils of war, and, as Joe Byerly has pointed out earlier in this roundtable, a manipulative method of voting, before the the Spartan war party took control. Even then Spartans were slow to act. A little less than a year would pass between the Spartan decision to go to war and the actual waging of it, and it was not Sparta, but her ally Thebes, who fired the first shot. In contrast to the quick moving Thebans, eager to take their enemies by surprise, Thucydides reports that it was not until the Thebans launched their attack on Plataea that the Peloponnesians began to truly “prepare for war.” The Spartans then sent to the Athenians yet another herald in search of peace (2.12), and followed this up by campaigning and marching with special slowness in hope that the Athenians might change their mind (2.18). The image of Sparta painted here is quite different from that suggested by Thucydides’ claim that the war was waged by a frightened Sparta. The Spartans did not fear the Athenians enough to immediately launch her full fury against Attica before the Athenians had time to prepare a defense. Giving the Athenians a last chance for peace was more important to the Spartans than dealing a crushing opening blow when the war began. Perhaps this is because they thought they could easily defeat the Athenians (in which case, what was there to fear? ); perhaps it was because they did not see the war as inevitable at all. The total picture one gets of Sparta on the eve of war is of a people divided, dragged into a war many did not care for because of the machinations of their allies and the deliberate insults of their enemies. It was less fear that drove Sparta to war than honor (see esp 1.86.5); their aim was not to rob Athens of her power, but of her pride. Athens alone of her contemporaries is found when tested to be greater than her reputation, and alone gives no occasion to her assailants to blush at the antagonist by whom they have been worsted, or to her subjects to question her title by merit to rule. Rather, the admiration of the present and succeeding ages will be ours, since we have not left our power without witness, but have shown it by mighty proofs; and far from needing a Homer for our panegyrist, or other of his craft whose verses might charm for the moment only for the impression which they gave to melt at the touch of fact, we have forced every sea and land to be the highway of our daring, and everywhere, whether for evil or for good, have left imperishable monuments behind us. Such is the Athens for which these men, in the assertion of their resolve not to lose her, nobly fought and died; and well may every one of their survivors be ready to suffer in her cause (2.41). A review of the origins and first moments of this war suggests that it was less a matter of growing fear and growing power, than a matter of tarnished honor and quests for glory. Athens’ growing wealth was a necessary condition for the war, but it was hardly the only or the most important cause of it. Had Athens’ quest for glory been less ambitious, had Sparta not tied herself to an ally hellbent on forcing her private wars and narrow interests onto the entire league of Spartan allies, and had the Greeks not been a people obsessed with insults, rank, and honor, this war may never have occurred. It was not an inevitable clash of fear and power that brought war to Hellas, but a very specific set of decisions made by a very specific set of leaders in the years before the war. In some ways this is a heartening conclusion. 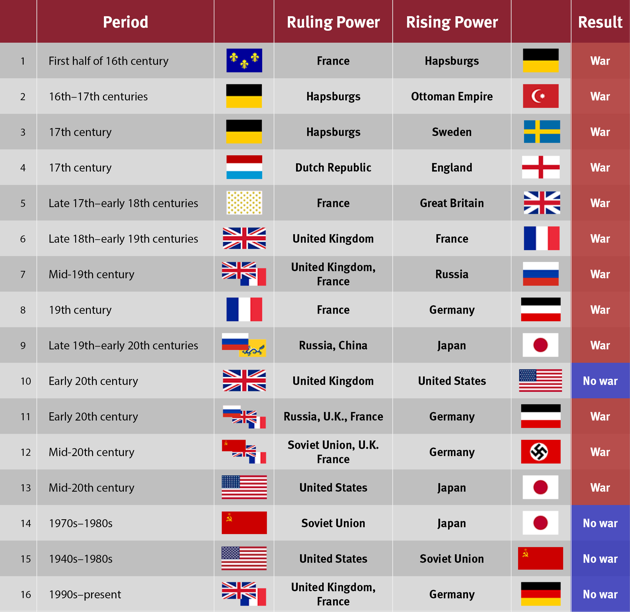 The war was not inevitable—it was not the preordained result of some inhuman “Thucydides trap.” If this war was not inevitable then conflicts between the rising and settled powers of our day are not inevitable either. Not all of the implications of this conclusion are so heart-warming. The war between Athens and Sparta is misunderstood. It was not a war between a rising power and an existing hegemon. It was not, as is so often told, caused by a hegemon who failed to find a place for a growing newcomer in the existing order. That better describes the first war between Athens and Sparta. The war of Thucydides' day was different. It was a war between two powers who had already reached a rough state of bipolar equilibrium. The Spartans had already accommodated the rise of Athens; at the end of their last war they had not torn down their walls, nor compelled them to give up their empire. Instead they had given the Athenians a secure place in the Greek world, a sphere of interests in which the Spartans agreed not to interfere. The lesson of the Peloponnesian War, may actually be the opposite of what many who invoke “Thucydides traps” intend! ‘Accommodating’ a rising power does not promise peace. The stability of such an accommodation depends very much on the nature of the power being accommodated. What exactly prompted the Athenians to change tack in the 430s is hard to discern. Though the Athenians did not formally break the treaty, they instigated more than one “event… which [was] equivalent to a breach of the treaty and matter for war,” especially the decisions to embargo the Megarans and war against the Corinthians in defense of Corcyra (1.146). It is possible that the Athenians stumbled into these decisions unaware of their consequences. But if Athens was truly led by one man, and that man was half the leader that Thucydides claims he was, then this is unlikely. It is from the mouth of Pericles, not that of the Spartan war party, that we hear the claim that the war was inevitable. Pericles was quite clear about his priorities: what he sought was Athenian glory, glory to be remembered through the ages. He believed that Sparta would never let Athens seize such glory unmolested. Thus the Athenians were to persist in war, despite any peace offers received before it began or destruction wreaked upon their fields and homes afterwards. The Athenians could not reconcile their ambitions with Spartan hegemony—or even a rough and tacit parity. What tore apart Hellas, then, was not a hegemon caught in a Thucydidean trap of fear, but a polis whose quest for glory could not be sated by stable equilibrium. Take from that what lessons you will. Note to readers: The following post was originally published at Zenpundit as part of the on-going Thucydides Roundtable. I encourage you to follow the comment thread there and read the other participant's posts as they are published throughout the week. On a summer night, nearly three thousand years ago, three hundred men of Thebes, wet and mud soaked, snuck into the town of Plataea with murder on their minds. Their attempt to launch revolution in Plataea was futile: most would die before the night was over. If their aim was political change, they failed, and failed utterly. But if their aim was undying fame, they succeeded. Perhaps they did not know that their deeds would echo through time, but they have. These were the men who began the Peloponnesian War. What they did is still read and written about thousands of years later. Why is this war so well remembered? This was the greatest movement yet known in history…there was nothing on a greater scale, either in war or other matters (1.1). Perhaps this was true in Thucydides day, but to moderns who have witnessed millions perish in global wars, the scale of the Peloponnesian War is minuscule. Even by classical standards, it can claim no special title in size or extent. Thebes and Plataea were separated by only seven miles. That is barely a shadow on the frontier of the greater ancient empires. Even the fabled Sicilian campaign, whose distance robbed Athens of her empire, was only half as far away as Caesar wandered from Rome, and only a fourth of the distance Han warriors traveled from their capitals at Chang’an or Luoyang to the farthest frontier of their empire. A bit less than three hundred Thebans died that day. This was a fairly normal casualty count for the war. Even Athens at her greatest could only put ten thousand hoplites into the field. In contrast, in one day of fighting at Cannae, Rome lost more than 50,000 men. Emperor Ashoka lamented that he killed more than 100,000 enemy soldiers in the conquest of Kalinga. Seen in this perspective, the Peloponnesian War was a tiny conflict, fought between the small towns of a fractious, tribalistic, and self-absorbed people. Despite this, it is not only remembered, but earnestly studied and carefully reconstructed. Many wars of far greater scale languish unremembered. Perhaps the key to the war’s hold on our minds is its complexity? This was a war that involved dozens of polities. It pitted land powers against sea powers, oligarchs against democracies, coalition against empire. Culture and ideology played their part in this war; so did domestic strife and civil conflict. This war spawned great contests for food, for wealth, and for power; it witnessed both plague and starvation. No matter what angle you wish to take, the Peloponnesian War has something for you. Yet the Peloponnesian War’s complexity is hardly unique. American history began, after all, with a war that stretched across land and sea, entangling enemies both domestic and foreign, flinging diverse cultures, ideologies, and political regimes into one violent contest. This sort of multi-sided warfare, one-part wheeling-and-dealing on the international stage, another part grandstanding on the domestic one, is the historical norm. It describes all great wars found in our records—and its shadows haunt the legends and ruins of wars who had no historian to record them. To parse through the tales of the Iroquois oral tradition, or piece together inscriptions from Mayan steles and tombs, is to be struck with wonder. It is wonder at the intricacy of their wars, the complexity of their alliances, and the drama of their betrayals. Above all, it is to wonder what classics these events might have produced if these peoples and places had a Thucydides to write about them. Alas! They had no Thucydides. There has been only one of him. That is all that truly sets the Peloponnesian War apart from the other wars of human history: this was the war witnessed by Thucydides. It is difficult to peg this Thucydides. Political scientists, historians, and military theorists all claim him as the father of their craft. Whenever one of these disciplines is infected with a new "path breaking" paradigm, a blizzard of articles are written to graft the latest fashion onto his work. This literature is enormous. Forgive me for quoting none of it. So many of yesteryear’s intellectual fads have died. They are forgotten. Thucydides and his history live with us still. He will outlast them all. In any case, their purpose for consulting Thucydides differs from mine. They approach his work like miners on the mountainside, drilling narrow shafts down through hardrock until they find something marketable. The results are predictable: Thucydides’ book is more often referenced than read, and when read, more often in part than in full. The quote is what matters. There is nothing entirely wrong with this. Analogies to Thucydidean events can be revealing; pithy Thucydidean one-liners add punch to all essays in need of it. But those who limit their acquaintance with Thucydides to a few snapshots miss a great opportunity. 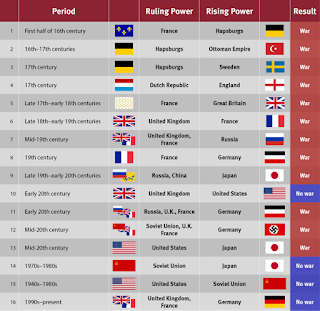 There is more to Thucydides than a frantic search to find another model for all time. If they look hard enough, the seeker of evergreen political models or eternal laws of war will find what they are looking for in Thucydides, though it is hard for me to believe that any thinker as subtle as he would smile on this quest. What I value in Thucydides is something different altogether. I do not turn to him for templates "for all time," but for an escape from my time. We all live in the moment. A cacophony of words and sounds follow us wherever we go, broadcast into our cars, our workplaces, our homes, and our pockets. We live in an unescapable echo chamber—an echo chamber relentlessly focused on the now. Not so with Thucydides! His history is about many things, but 2016 is not one of them. Here then is a chance to put the present to the side. Cast away that dreadful election! Muffle the droning of the news reports. Close the Twitter stream. Before us is a world that has never heard of the twenty-first century nor imagined its problems. Your guide to this world will be a man from an alien past; his values and assumptions will be starkly different than your own. Wrestle with him—let your beliefs and assumptions be tested. What better chance to assay the building blocks of your politics than by exploring the politics of a different age, removed from the passions of the moment? Thucydides does not spell out his lessons for you. Instead he invites you to follow along with him and find what lessons history allows by yourself. To know a single old book well, even if it hasn’t been canonized as a “classic,” is to have a certain anchorage you can’t get from most contemporary writing…you should find a few meritorious old writers you find absorbing and not only read them, but live with them, until they become voices in your mind — a sort of internal council you can consult at any time. Thucydides earned a place at my “internal council” table. A spot has been saved for him near the doorway, between the seats given to Xunzi and Ibn Khaldun. One day he might sit opposite to Tocqueville; the next he will debate with Madison. In all cases I will be glad to hear his voice. But Thucydides is a wily one, and I am not quite ready to let him in yet. I have too many questions that must first be answered. So I invite him instead (or, at least, so I imagine) to a cozy side room, warmed by a great fire place and graced with two old armchairs. I ask him to sit down and bear kindly the interrogation that is to follow. “How should I read your book?" "Should it be understood as a work of what we call history, or literature, or social science?" "How can I distinguish between your narrative of events and the events themselves?" "Could your explanations be wrong? How would I know?" Thucydides smiles, pulls out his manuscript, and begins his reply. I listen carefully, questioning here, prodding there, occasionally crying out, “You rascal, you almost fooled me!” and then arguing furiously against what I hear. I know these questions will not all be resolved in one sitting. It will go on for weeks, I think, and even then some queries will remain unanswered. But by then the old Hellene will be ready to take his seat place at my table. I, in turn, will have learned a great deal about the world and its workings that I'd never considered before. Luckily for you, Thucydides no longer lives in flesh and blood. I cannot secret him off to my study for weeks on end to prevent others from stealing his company. Everyone reading this has an equal claim to the historian; all can spend their evenings considering his words. I invite you to do so. Question him about his work, argue with him about war and power, badger him about what he might think of the wars in Vietnam or Iraq. Ask away! Just remember to write down what you have learned. Share with us what you have gained by wrestling with Thucydides. I will have more to say about Book I later this week. For now, welcome to the Thucydides Roundtable. 1 Joseph Sobran, "Reading Old Books," The Imaginative Conservative (8 July 2013).